2016 was a big clear-out year for me! So I think it is the best decision too, I don't miss them yet, so I'm satisfied with my decision. I was so relieved at the latter, that I nearly cried! The Chestnuts are taking over here in Rooibosch... they have rallied a group of critters and are already setting up camp in a corner of the woods closest to the Watermill bakery. They keep mumbling something about needing easy access to fresh milkbread every morning... Looks like they are settling in very nicely! Glad they are settling in! Thanks for your comment. I hope you get a 'new' family soon. I don't have the Puddlefords yet however I recently got Mr Webster and I looooooooove him so much. He is very lonely though, being the only fowl in the village of Mulberry Woods. ;) He is one of the Sylvanians who I have loved even more in real life than I anticipated. So I expect I would feel the same about the Puddlefords.... and Mr Webster would get his jolly disposition back if he had relatives arrive in the village! Thanks for the comment Emily, and visiting my blog. I hope you get a family for Mr Webster soon! Luckily I have you who always encourages me! I have a little squirrel girl whom I found from flea market ( I just had to give her home...) - she has lost her tail and has no family, so I think Furbanks would be perfect family for her. Other little ones I have have all their families, but she is all alone. Thanks for the comment and visiting my blog. I hope your little one gets a family soon! I appreciate you coming over and visiting my blog, I hope you will do so more often in the future! Hi Eaton! Your blog was one of the first I followed when I started my collection and it has always been very inspiring.As I´ve already told you some other times, reading your stories is always a real pleasure and I still love to re-read some of your old posts. It really helps me to relax and unwind after a long and stressful day. That´s why ,it would be a great honour to welcome the Puddlefords to my village. The villagers of Sweet Bery Valley are very kind and friendly and I´m sure they will help the Puddlefords to settled down and feel at home. Probably, Daisy Buttercup will be the only one who could bother them a little bit. She would like to know every single detail about Sugarbush Valley, one of the most renowed villages in the Sylvanian map. I know Beth will soon make friends with Eleanor Bramble, she is the village dress maker, and Mabel Periwinkle who was the owner of a small sewing shop, and now that she is retired has even more time to knit and sew. 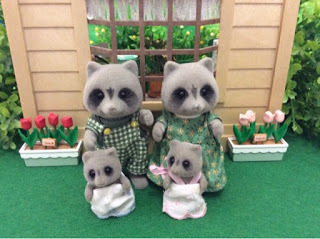 The three of them will love to chat about their sewing tips and skills over a cup of tea. Besides, Beth will be able to be closer to her sister and brother in law. Sweet Berry Valley is not that far from Marigold Creek and now that Nelson has tasted the wine his relatives sell in their pub he might not be so reluctant to visit them and have a toast for a new beginning. I also believe a change of scenery will help Nelson to improve his mood. We never know , he might not be so grumpy in a new place.He will be the foreigner this time and he´ll have to try his best to make new friends, or at least one or two. I don´t know if Beth and Nelson would like to continue running their little business but if they do I´m sure their new neighbours will appreciate the good quality of the fabrics and Beth´s ability to turn a piece of fabric into dreamy cozy bed linens. As for the triplets, they will be well looked after by Lucie Fenton at the nursery village. Lucie is a sweet, caring and patient teacher and they´ll love her as much as they love their former nursery teacher. I hope you don´t mind such a long reply. I read your post in the forum a few days ago but I didn´t have my laptop with me until today and it was a very long reply to write on my phone. I knew tomorrow was the dead line to enter the giveaway and I thought I was not going to be able to take part. I also hope the new year brings you, among other things, the motivation and inspiration to write at least a short story from time to time. Your stories are lovely and your readers really appreciate them. After much consideration I have decided that Nelson and his family will be most happy in Sweet Berry Valley! Congratulations! Gee I don't even know for how long have I tried to get my hands on a mouse family!! I LOVE - no, I ADORE Brambly Hedge books and have viewed videos (first with my kids when they were little, then just by myself) for who knows how many times, and I have dreamed and drooled after mouses ever since. One of my biggest dreams for at least 5 to 6 years has been to find one - if not whole family then at least one mouse, so I could finally try to make on scene from Brambly Hedge all my own... Aaa *sigh* What happiness it would be! 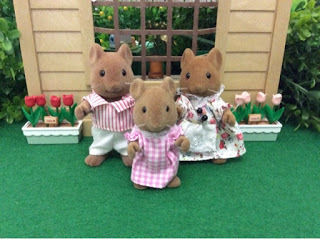 Irina, I'm keeping my fingers crossed that a cute mouse family will soon move to your village. Merry Christmas! Hi, i hope you find your inspirations because i really like you stories. 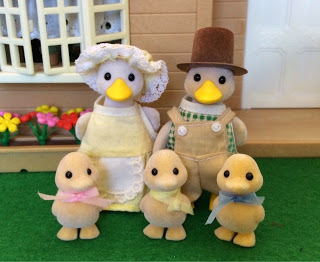 You have so much orginal sylvanian families goods and families. Puddleford family is funny and so authentic-looking family. i also liked to tell stories about sylvanian families but my blog is in finnish and i use the dollhouse toys in photographers in my villages. Greetings from finland. Thank you for your kind comment. I really hope my SF groove returns in 2017! Thanks for visiting my blog! Huge thanks to each and every one who entered and left a comment! In the end Cutata was the lucky winner. I'm honored to have the Puddlefords move to her wonderful village. Just to keep everyone in the loop and have 'witnessess' I'm delaying the postage of the family till middle Jan 2017, purely because I'm worried it will get lost. Our SA post office is notorious for losing things during this time of the year, and I know I will be heartbroken if Nelson and his family never arrives in Sweet Berry Valley.